Now, with a sharp cut of 35 bps in the base rate, HDFC Bank has ensured that no bank will be able to match them in the near future without bleeding on margins. Till recently, State Bank of India (SBI), the largest public sector bank which controls 17 per cent of the loan market, showed the way and others followed. SBI was the first bank to cut deposit rate in September 2014, much ahead of the rate cycle cut started by the Reserve Bank of India (RBI) in January. It also became the first bank to cut the base rate - the benchmark lending rate to which all loan rates are linked. Others followed suit. Till a few years earlier, HDFC Bank's benchmark lending rate was about 50 basis points (bps) more than the marker leader. The most valuable bank of the country kept on narrowing the gap. And, from earlier this year, they started to match the largest lender and the largest private sector lender. Now, with a sharp cut of 35 bps in the base rate, HDFC Bank has ensured that no bank will be able to match them in the near future without bleeding on margins. This was the sharpest move by any bank in this rate cut cycle. "It is not too clear on what is likely to be the response from other banks as they need to strike a balance between growth and NIM (net interest margin) outcomes... We expect other banks to follow but the quantum may not be the same; it may not be immediate with more action likely on deposit rates," Kotak Securities said in a research report. It is the NIMs which gave HDFC Bank the room to cut rates sharply. Its NIM has ranged between 4.1 per cent and 4.5 per cent for many quarters, despite profit growth falling to 20 per cent from 30 per cent in the last four to six quarters. Compare this with other banks, which struggle to maintain NIM at 3.5 per cent. One reason for the high margins is the share of current and savings (Casa) deposits, the low cost ones. 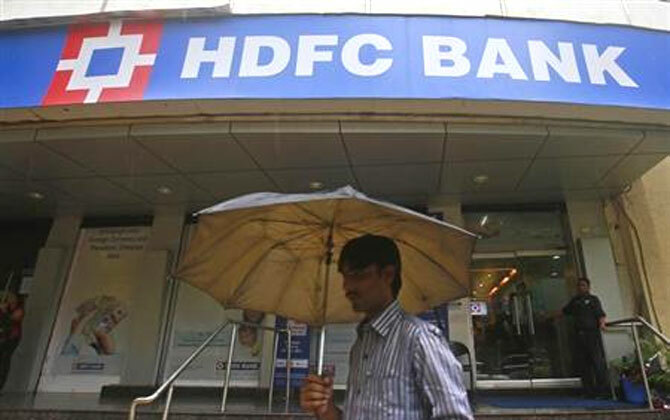 HDFC Bank's share of the Casa ratio was 39.4 per cent as of June-end - one of the highest in the sector, though it fell sharply from 44 per cent a quarter ago. "We think the ability of corporate banks to take such large base rate cuts is limited without impacting their NIMs as 70-75 per cent of their loans (FY15) are linked to the base rate," Nomura Securities said in a note to clients. According to the broking firm, HDFC Bank was able to take such a large base rate cut as only 30-40 per cent of its loan book is linked to the base rate. ICICI Bank, Axis Bank and public sector banks have 65-75 per cent of their loan book linked to the base rate and their NIM impact will be higher due to base rate cuts. The consensus on the Street is while HDFC Bank will also see pressure on margins, it will still be able to maintain it at over four per cent. HDFC Bank has a significant portion of its loan portfolio consisting of automobile loans and personal loans, those are given at fixed rate. So, its return from existing customers will not be affected by this sharp cut. In addition, the bank doesn't sell home loans - which are mostly floating loans - directly to the customers. Suresh Ganpathy from Macquarie Securities explains that HDFC Bank is in a better position to take such a steep cut in their base rate because their entire loan book will not re-price immediately. "Since they don't have a home loan book, it is of help because the home loan is mostly floating and therefore the impact for them on margins would be lesser than other lenders which have a big home loan portfolio. I believe that because of this reason other lenders might not be able to reduce base rate in the same quantum at one go."